How to Develop a Packer and Mover App? Over the past years, packers and movers industry has gained a lot of prominence coming its way. Today, a large number of population are using packers and movers services when they want to relocate or change their residence. The main idea behind developing the packer and mover application is to handle the shifting activities belonging to family and industrial goods, lifting machinery and heavy equipment as per the customer requirements. Having offered the best mobile app development for various industries including healthcare, restaurant, taxi and much more. Tech Pathway is the right choice for your packers and movers mobile app development. 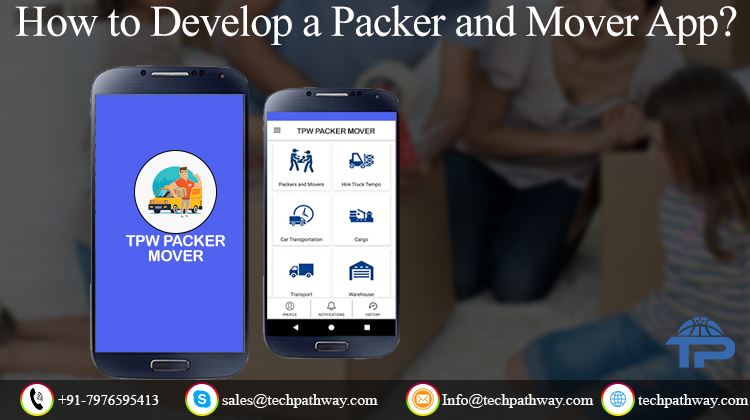 Let’s have a detailed look on the packer and mover app development process and how it can turn lot more effective. The app needs to have great features which not only attract users but also helps in accomplishing success for companies in this sector. Our packer and mover app comes with the advanced features, dashboards and management tools for you and your app users. The cost of developing an app like this with minimal features can cost you around $5000 to $7000. Now, if you want to develop an app with more advanced features, then the cost may raise respectively. So, if you are into this industry and want the best packer and mover app then we are here to help you with best of our app solutions. We come up with an idea, analyze it and then offer you the design approach. And once the design is finalized by you, we start with the development and provide you the final app with testing.